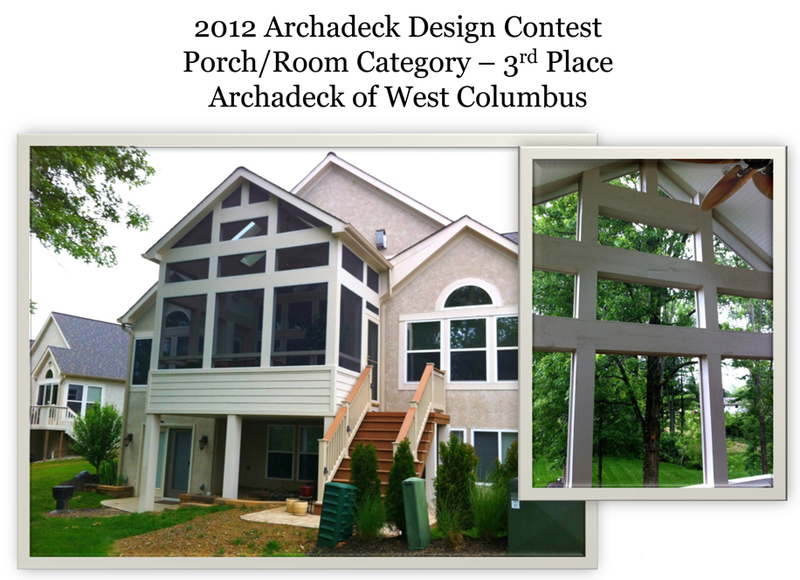 Archadeck of Columbus discusses the benefits of choosing to re-deck your existing wood deck with synthetic decking. We removed the decking and railings on this deck in Powell, OH and resurfaced the existing structure using TimberTech composite decking- stunning! Being in the business of outdoor structures, Archadeck of Columbus has seen our fair share of maintenance nightmares with pressure treated wood. If you are considering the addition or a new deck, or it has come time to re-deck your existing deck, there are some things you need to know before you make the final material decision. With a growing trend towards longevity and low-maintenance, synthetic decks deliver on both. Out of the approximately 80 synthetic deck projects we do in a year, about 30 of those are re-decks, and the majority of these are re-decking from pressure treated to synthetic. This is the before image of the same deck pictured above. The original deck was built using cedar. 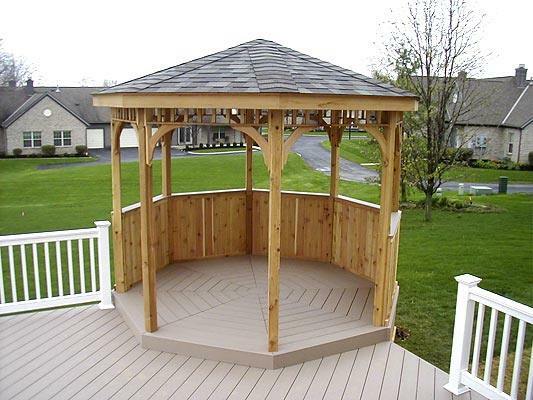 Keep in mind that all outdoor structures are built with pressure treated pine framing. This is used so the structure does not rot over time, and also so no termites will eat it. There are other natural woods that can be used for framing purposes, such as cedar, but they cost significantly more and deliver the same results as using pressure-treated. Most of the time, when we are inspecting an existing deck as part of the planning process for a re-decking project, the framing members are usually still in great shape. This allows us to re-deck the surface, re-skin and put the new synthetic down. 95% of the cases where we have an existing wood structure, we are able to use the structure for the re-decking. There are times when Archadeck of Columbus may need to add additional framing, replace insufficient framing, or repair the framing before we can proceed. In these cases, it is most often because the framing was not completed correctly when the deck was originally built and it involves getting the deck up to our quality standards before we will proceed. Before- this old Cedar Deck which was beginning to show some structural deterioration. Note the stairs in particular. They are not level as evidenced by the railings. How many of you have seen a wood deck that looks really bad? If you have, then you probably remember the wood on the deck floor may have started to crack and deteriorate. Maybe the nails used to install the deck were popping and protruding from the flooring boards even though the railings were in half decent shape in comparison to the floor. The reason for this is a natural phenomenon that horizontal surfaces tend to get beat up, and suffer from less wear and tear over time than vertical surfaces. On the majority of our re-decks we install new railing, but it is often possible to retain your existing railing and install only a new rail cap, but this is only in certain circumstances. The design was changed allowing for better traffic flow. 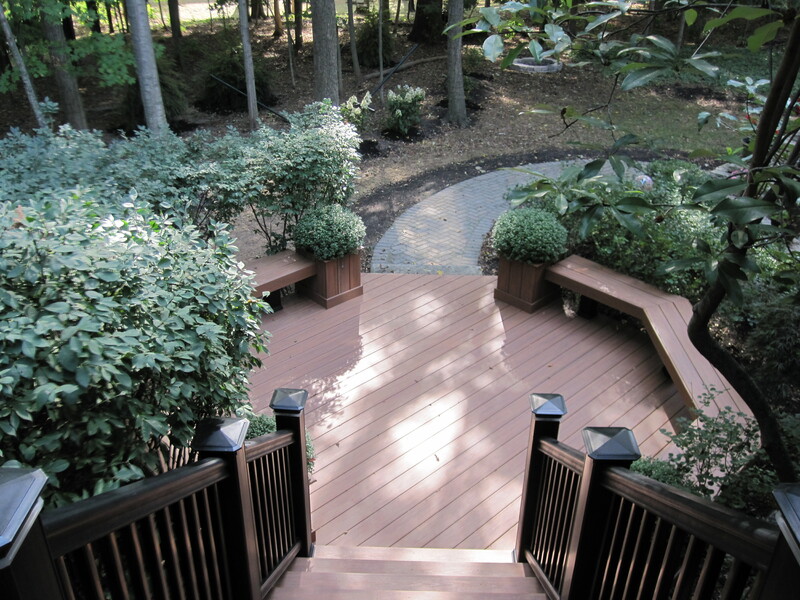 TimberTech Earthwood Decking was installed with a Cedar Railing including black aluminum pickets. The trim and railings were stained to match the trim on the home. This beautiful! Project was custom designed and built in Dublin, OH. The growing trend towards synthetics has become more evident over the past 5 years. In our market where we are building decks, 70-80% of the time the demand is for synthetic versus wood, and the primary being synthetic; rewind five years back, and this data was in reverse with the wood being in higher demand. With re-decking, as with any of our outdoor living structure projects, we are always happy to comply with the homeowners budgetary needs and aesthetics. Most often Archadeck of Columbus recommends re-decking in a synthetic decking such as TimberTech because of the low maintenance and longevity benefits. Being a predominately wood builder, we try to communicate the maintenance needs, care and protection required of choosing to re-deck with wood to the homeowners so they may make the best decision to suit their lifestyle and needs. If you are considering re-surfacing your tired wood deck with a synthetic, the most popular one is our region is TimberTech. 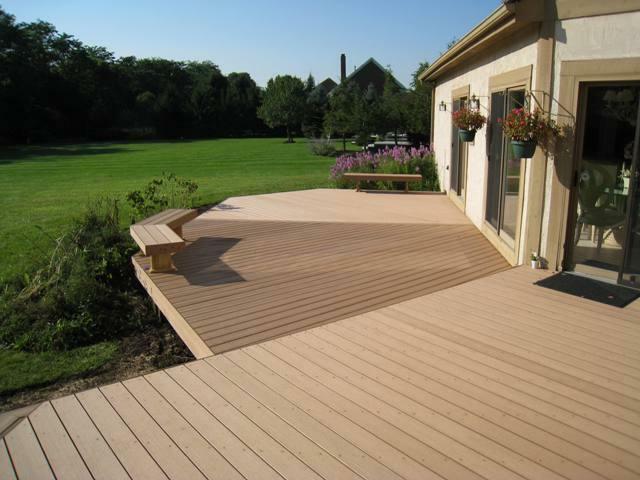 By choosing a synthetic product such as TimberTech, they not only offer an array of up and coming selections such as their XLM , Terrain and Earthwood Evolutions line, you are also eliminating the chore of painting and staining your deck in the future. 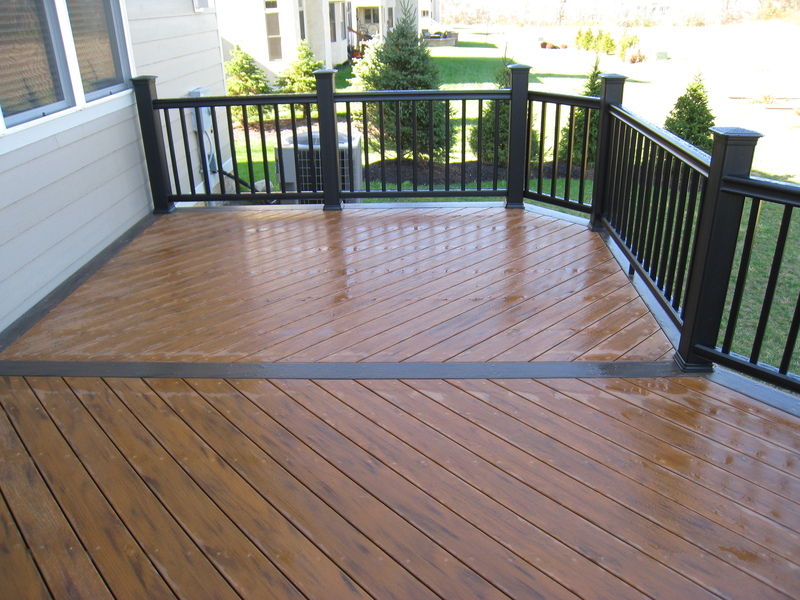 Last but certainly not least, one of the most important considerations is replacing the cost associated with re-decking your existing wood deck with synthetic. 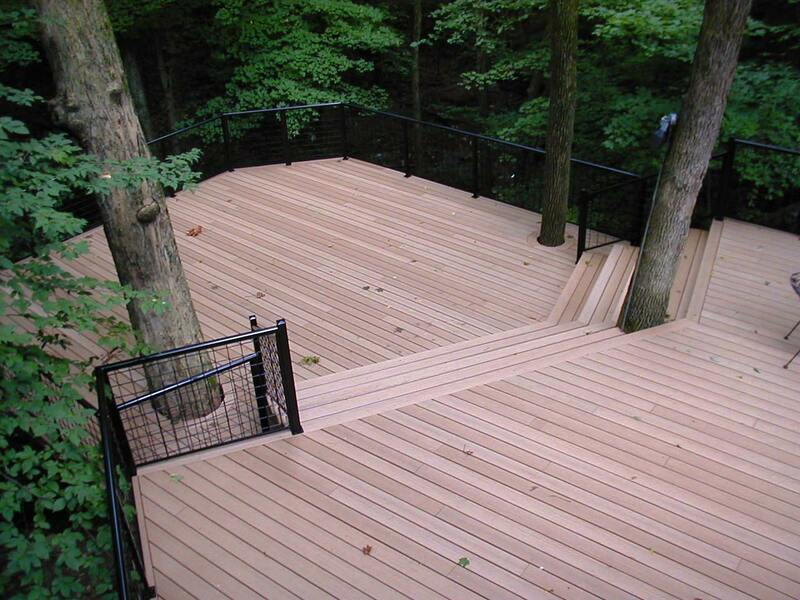 Synthetics are typically double the cost of the traditional pressure treated pine deck. Before you make the decision to re-deck in synthetic you should take into account the time you plan to live in your home. If you stay in your home 4 or 5 years or longer, you will get your money out of it and you will also create an investment that you and your family can enjoy into the future! You can see more examples of wood to synthetic redecking, and backyard makeovers by visiting our composite and PVC deck photo gallery and our before and after photo gallery located on our website. 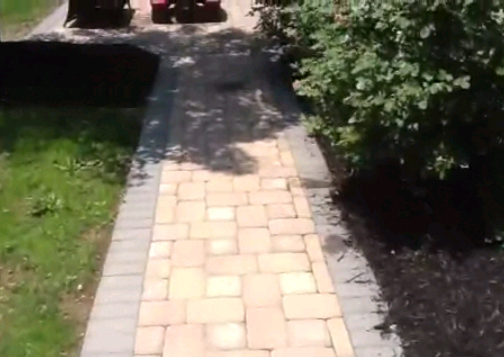 As an outdoor builder, there are so many facets of what we do every day. We consult with new clients. We create designs to translate their needs and wants into physical structures. We build those structures. While we’d love to think our designs and processes are some of the best in the country, or at least top ranking in our national franchise, it’s incredibly humbling to actually win. Last week we participated in Archadeck’s annual convention. We were able to share and gather ideas from Archadeck locations nationwide. Each year there are design awards in 4 different categories – deck designs, porch/enclosure designs, patio and hardscape designs and combination project designs. The combination projects include 2 structures such as a deck and patio combination project or a porch and deck combination project. The award winners are determined by votes from our corporate office and even more importantly from our peers. We won 2nd place nationally in the patio and hardscapes design contest and 3rd place nationally in porch and enclosures design contest. These pictures are the projects that won the design awards. Designing is such a rewarding part of our business. It’s not about the structures themselves. It’s about how those structures and outdoor spaces create a magical backyard space for our customers. We’d love to provide a free consultation to you to discuss your ideas to enhance your outdoor living with a porch, hardscape, deck or other structures. 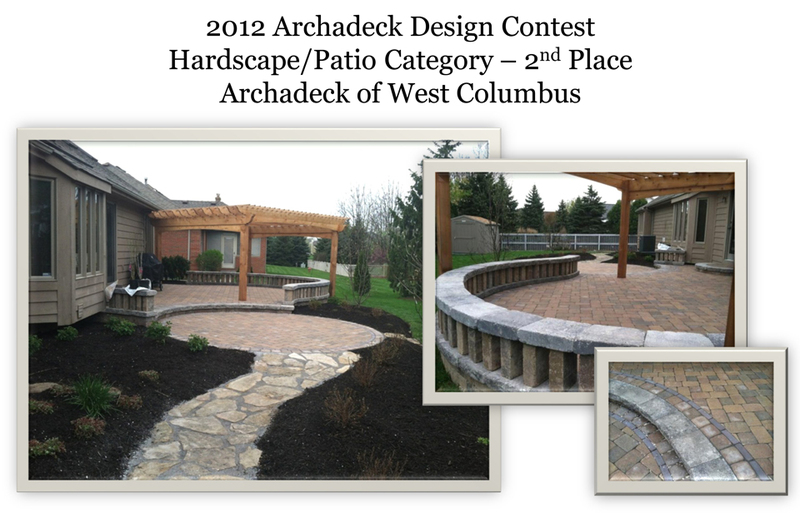 Please give us a call at (740) 879 – 3730 or email us at westcolumbus@archadeck.net. To see more pictures, please visit our Columbus patios and hardscapes online photo library and our Columbus porches picture gallery. We look forward to your call. Archadeck of Columbus takes you on a trip through the many beautiful colors to build your new TimberTech deck from. With all the new composites that are on the scene, each manufacturer has their own color palette to choose from. In our experience working with many different synthetic decking brands, among the most beautiful composite undoubtedly has to be TimberTech. The TimberTech line offers superior scratch, stain and fade resistance, this means the lovely color your deck starts out with is the color it will keep. Much of Timbertech’s decking also rivals the look of real wood with graining and undulation so close to the real thing you have to walk right up on it to tell it is indeed synthetic. 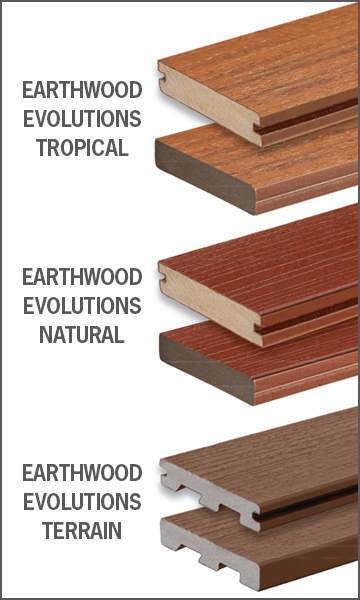 Since TimberTech offers a wide array of beautiful colors to choose from to build your new deck, we only thought it fitting to take a closer look at some of their most popular hues. 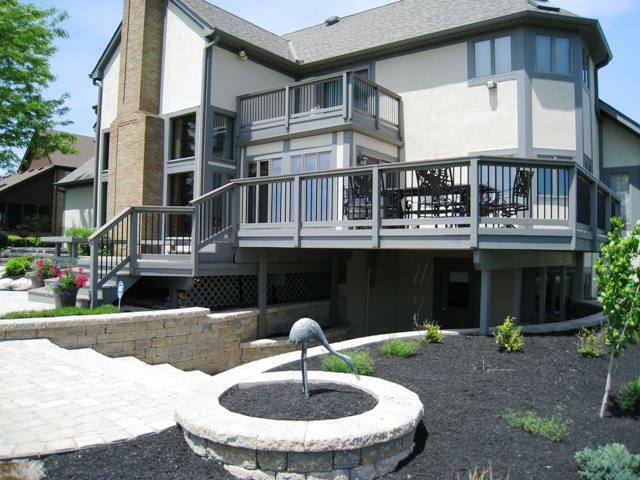 1) This stunning first and second story deck in Powell, OH was completed with TimberTech XLM in Harvest Bronze, with a coordinating TimberTech Radiance rail. The space also features built-in bench seating and planters for a seamless space that becomes one with the lush landscape surrounding the area. 2) A golf course plays as the backdrop to the unique deck in the Muirfield community of Dublin, OH which is shown below. We used TimberTech Earthwood Evolutions decking in Teak with a Walnut border and streamlined cable rail. A true masterpiece. 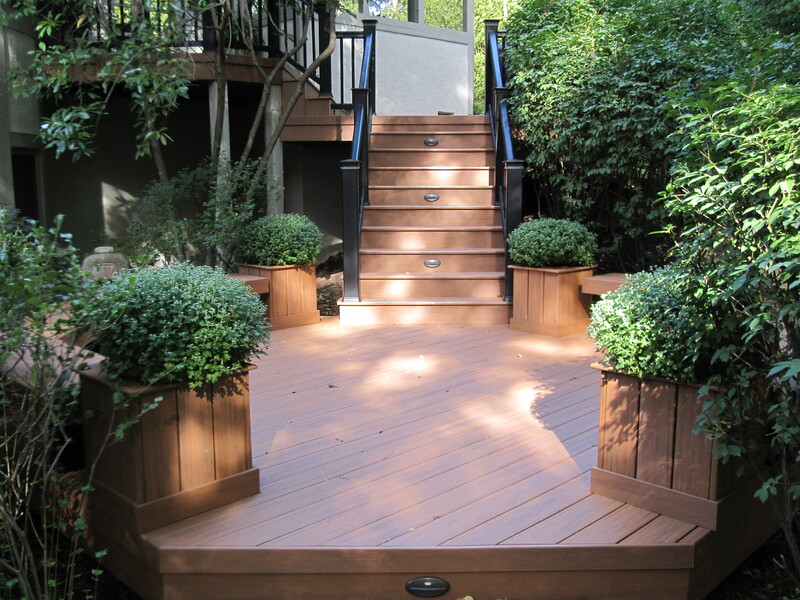 3) This deck also features TimberTech’s Earthwood Evolutions in Teak with a Walnut trim and parting board. 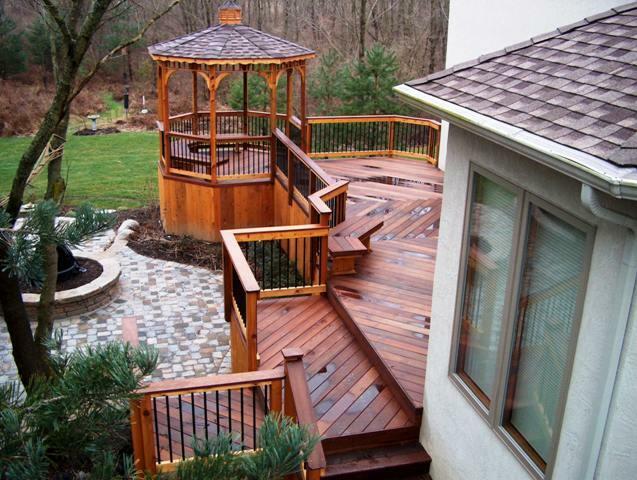 Notice how closely this deck mimics the look of real wood with shading and graining throughout. 4) An aerial view of this gorgeous TimberTech Earthwood Evolutions deck lends a bird’s-eye view of the colors and patterning. We paired Walnut alongside black aluminum railings for a beautiful contrast. 5) The low-to-grade deck in Columbus, OH shown below showcases the beauty of TimberTech’s XLM decking in Sandridge with Mountain Cedar trim. 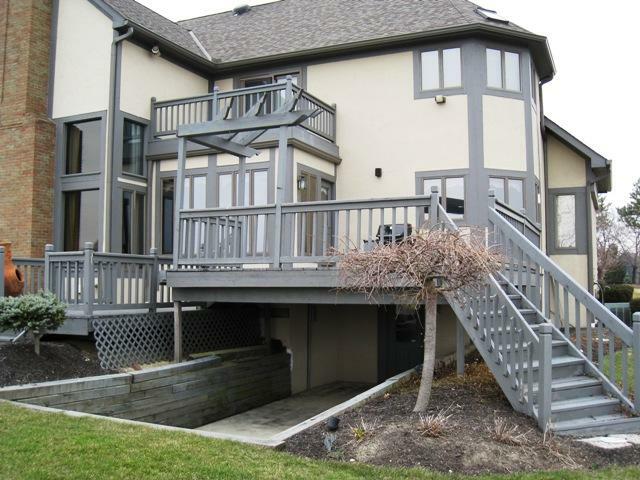 6) This multi-level deck flows graciously with the lines and colors of this existing home. We used a winning combination of TimberTech Earthwood in Walnut with a stained cedar rail alongside black aluminum pickets. 7) This outdoor living combination in Columbus, OH includes a TimberTech XLM deck in Walnut Grove with a low maintenance white vinyl rail. The deck spills onto a charming hardscape patio area below. 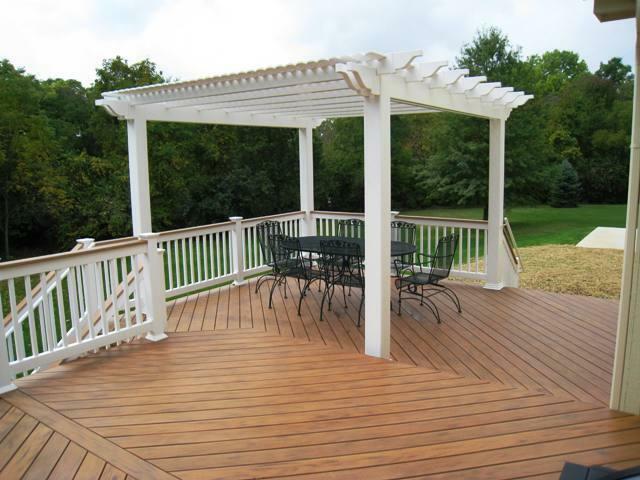 8) This Columbus low-to-grade deck includes multi-levels and a gazebo which houses a hot tub for enhanced enjoyment. 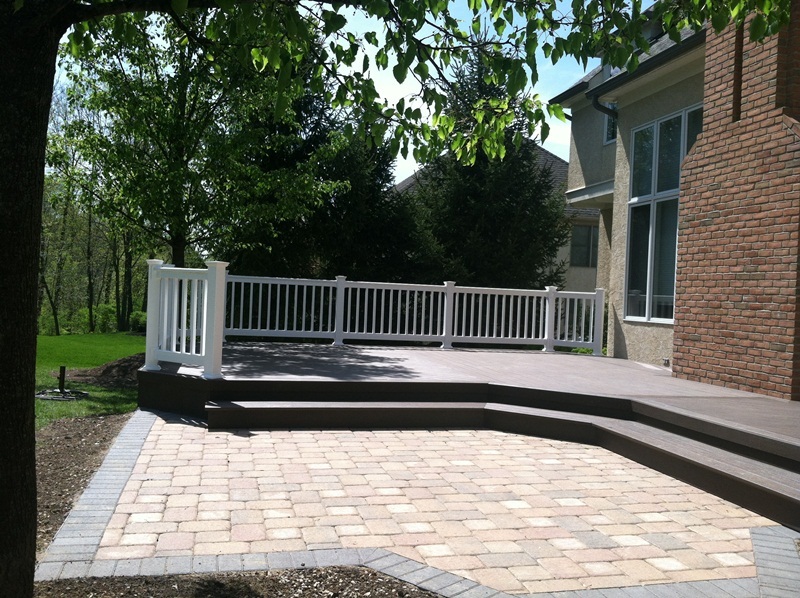 The deck is constructed from TimberTech Twin Finish decking in Gray. 9) Another low-to-grade beauty in Columbus, OH finished with TimberTech XLM. This palette is breathtaking in Rustic Bark with a black Radiance rail. 10) This deck has a stunning curved design and was completed using TimberTech Twin Finish in Cedar with an ornamental rail. To see more examples of the beauty of TimberTech decks, you can visit our composite and PVC deck gallery located on our website.